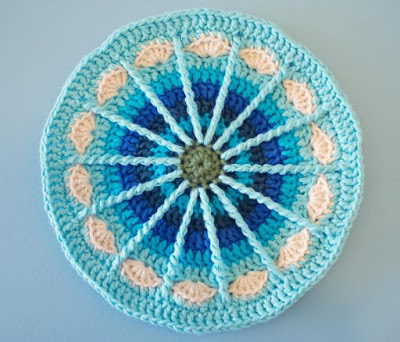 Bring you this pattern I found on the internet. 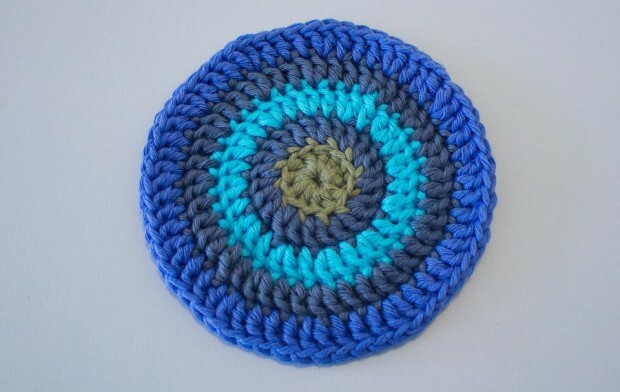 I found it very beautiful these colors combining! I think you can even use it as a pillow case ... Well.. using imagination and creativity we can use this pattern to many decorations. If you don’t have a Tunisian hook, you could also use a regular steel hook. Just make sure you have enough room to wrap your yarn around it at least 10 times. 1. use your regular crochet. Begin with a magic ring and secure with a point. Chain 2, and make 11 dc’s in the ring. This gives us a stitch count of 12, including the ch2. 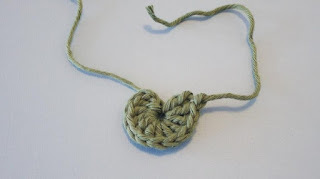 Cut the yarn and pull through the loop on your hook, and pull the ring closed to make a circle. Thread the yarn end through the needle and insert in the first dc you made, through both loops, skipping the ch2. 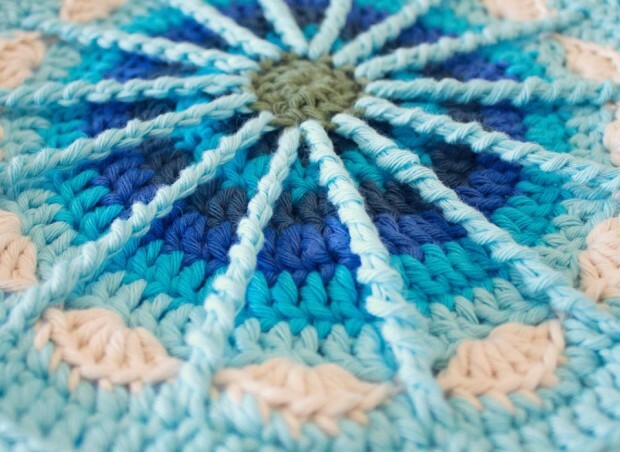 Pull the needle through and now insert it in the back loop of the last stitch you made. 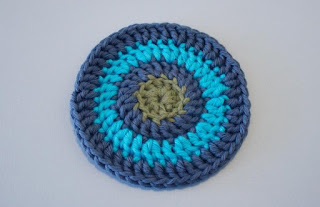 Pull the yarn a bit to close the circle, but make sure you don’t pull too hard; we want to keep this faux stitch we just made! We’re going to close rounds like this after every round from now on. Finish off. 2. Begin with a slip knot on your hook, to make a standing stitch. We’re going to use this in every row from now on. We’re going to close the round like we did before, so grab your tapestry needle and close the circle. 3. 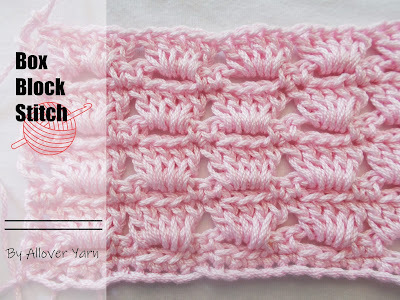 Start with standing stitch, then *dc 1, 2dc in next stitch* around, through both loops. (36 stitches) Finish the same way as before, using your needle. 4. 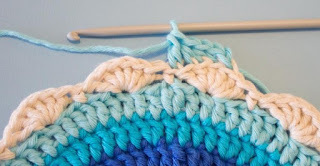 Start with standing stitch, then *dc 2, 2dc in next stitch* around. 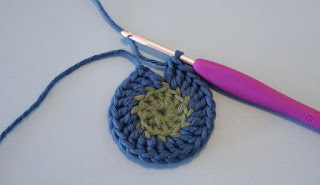 (48 stitches) Finish the same way as before, using your needle. 5. 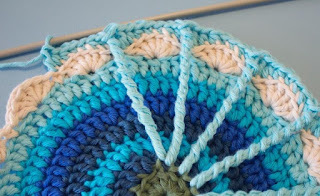 Start with standing stitch, then *dc 3, 2dc in next stitch* around. 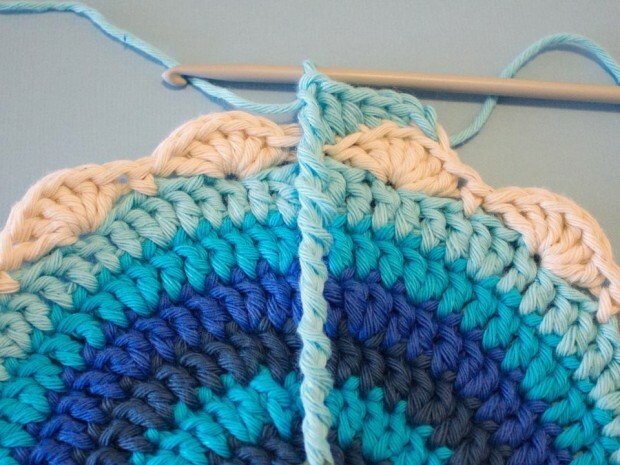 (60 stitches) Finish the same way as before, using your needle. 6. 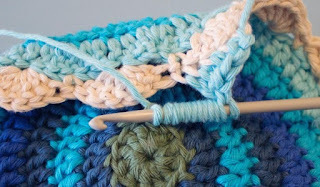 Start with standing stitch, then *dc 4, 2dc in next stitch* around. 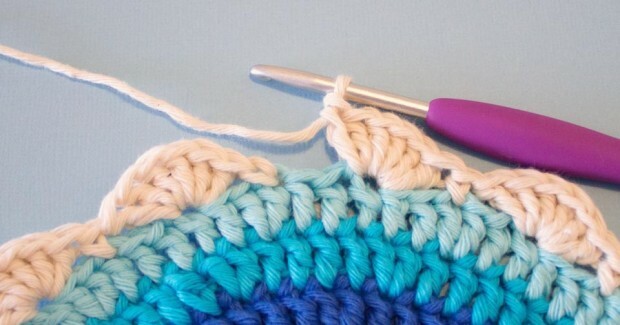 (72 stitches) Finish the same way as before, using your needle. 7. 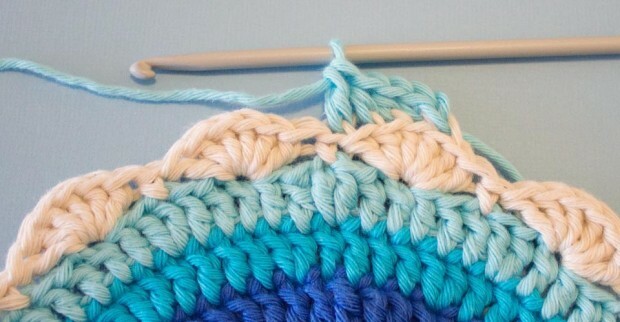 Start with standing stitch, then *dc 5, 2dc in next stitch* around. 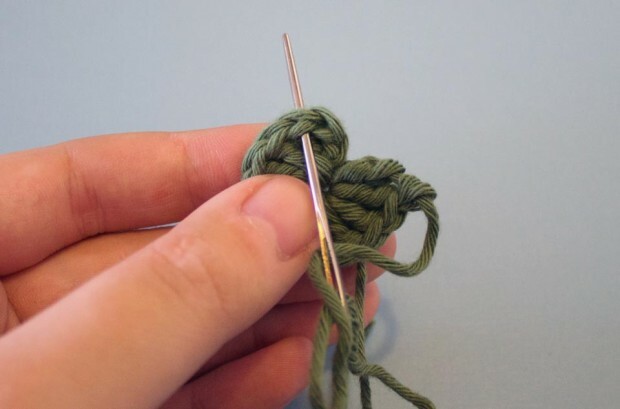 (84 stitches) Finish the same way as before, using your needle. 8. We’re now going to make the ‘wedges’. 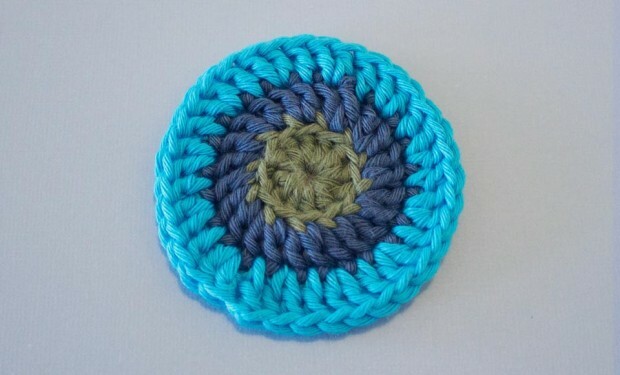 Insert your hook through both loops and pull up a loop. Yarn over and pull through the loop. Skip two stitches, and work 6 dc’s in the next stitch. Skip another two stitches, and make 1 sc. Continue in the same manner. 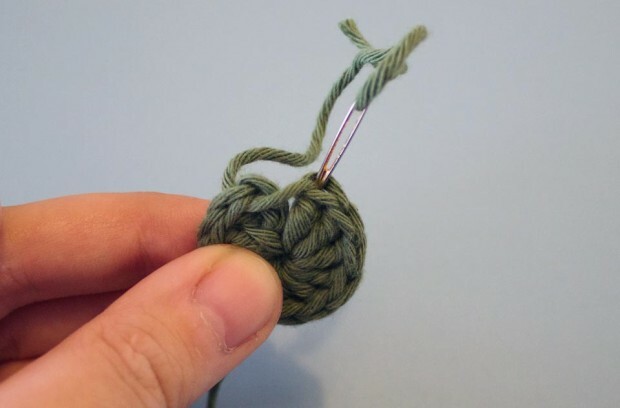 When you’ve made the last wedge, cut the yarn and pull through the loop on your hook. Grab your needle and fasten off like before, in the first dc of the first wedge. 9. 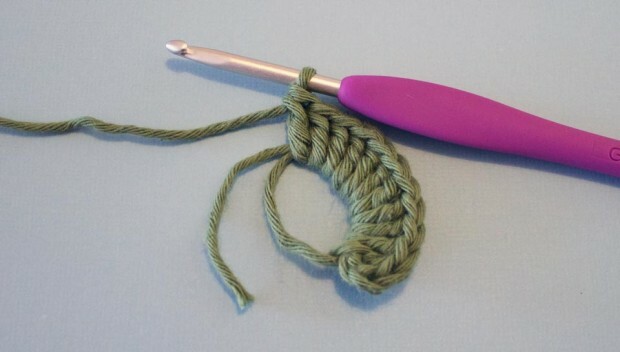 Grab your Tunisian crochet hook and insert in the 3rd dc of any wedge, in the back loop only. Pull up a loop, yarn over, through loop on hook, and make a sc in the next stitch, a hdc in each of the next two stitches, and a dc in the sc of the previous round. Insert your hook into the front loop of one of the dc’s of round 1. Pick the loop that is directly underneath your wedge, to make the spoke a straight line. 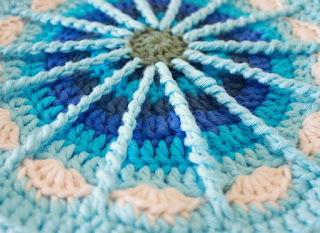 Pull up a loop, YO, pull through two loops, *YO, pull through two loops,* until you’ve reached the top of the stitch. Go on around the circle with *2hdc, 2sc, 2hdc* in each wedge, a dc in each sc, and a spoke after each dc. You’ll notice that there are 14 wedges and only 12 front loops available; work the left and right spoke of one wedge into the same front loop, and repeat again at the opposite side of the circle. 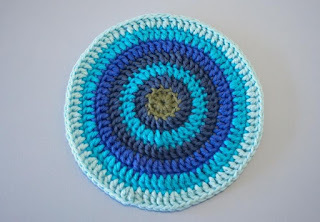 You’ll have to check and see which spokes would look good into one front loop stitch. Just make sure there are 5 spokes between each ‘double spoke’, to make it look even. Once you’ve reached the end, cut the yarn and pull through. Finish off like you’ve done before. 10. Start with a standing stitch, work 1dc around through both loops. Finish off like you did the other rounds. Is that ... I hope you enjoyed it.